Snowdrops at Hopton Hall - Usually open every day from early February to early March . The Gell family are recorded as holding an estate at Hopton since at least the 14th century, and can be traced with varying degrees of certainty back to Robert Gyll, a juror at Wirksworth in 1209. His posterity grew rich on the proceeds of marketing lead. Ralph Gell, grandson of the Ralph recorded in 1327, who died in 1433, is designated in a charter as tenant in chief of Hopton. Thomas Gell built an Elizabethan manor house at Hopton which was later known as Hopton Hall. The house was largely remodelled by Philip Gell in the early nineteenth century. In 1883 the Hopton estate stood at 3,744 acres. Much of the estate was lost in 1978 to the Severn Trent Water Authority in order to be flooded for the vast reservoir known as Carsington Water. The Hopton manuscript is written in the mid-fifteenth-century Norfolk dialect and was held in Hopton Hall in Derbyshire for centuries. It is an anthology of religious prose and verse in medieval English. 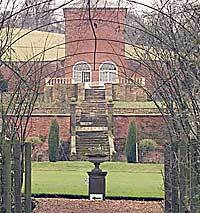 In the gardens is the crinkle-crankle wall, a brick forcing wall for fruit built in the 18th century. Much of the hall is now given to holiday lets. Each year, the gardens are open to the public with a grand display of snowdrops in February/March and roses later in the year.